I am a person who loves color. Red, yellow, blue, pink, oh how the list goes on and on. But one place I do not like to have color in is my food. Now, I am not talking about the “rainbow” of colors you get from fruits and vegetables. I am talking about the artificial colors used in a majority of our processed foods you find in grocery stores across the county, even the world. If you have missed the memo on artificial dyes found in foods, don’t feel bad. It is not a widely publicized topic of conversation on your local news. You probably hear more about Kim Kardashian’s outrageous style disasters before you hear the term “Yellow 6” or “Red 40.” If you have come across this information, then you have an idea of where this article is going to go. In this latest post, I am not going to bog you down with scientific details or research explanations. It would take too much time, and quite frankly, I think you would loose interest. I just want to highlight the nitty-gritties of this so you can become more aware of what you are putting into your body, and the bodies of those around you. I recently became interested in learning more about artificial food dyes after talking with a health professional about my daughter’s rather limited diet. My oldest has been a picky eater since she could self-feed. And it has been hands-down one of the most frustrating experiences as a parent. Sitting at the kitchen table until nine o’clock at night, tempers flared and still not a single green bean has left the plate. Battles over limiting candy and fighting off soda cravings. And the ironic thing is, as my friends would tell you, I am an extremely health-conscious person. Don’t get me wrong; I do indulge in fried foods, delicious desserts and frozen margaritas. But I also find a way to balance my indulgences with sensible eating and moderation. I want to put forward a positive example for my family, and honestly, I love learning about healthy nutrition. So having a kid that is the exact opposite of me when it comes to food has been exasperating, to say the least. The problem is, our children (and ourselves) are engulfed on a daily basis with unhealthy foods and treats. You see it in gas stations, on billboards, television commercials and in most of your grocery aisles. These tempting items smack us in the face constantly, and when you dive into the forbidden pleasure, it leaves you wanting more. It is the world we live in, so can you blame a 7-year-old child for wanting all those delicious treats offered by large food corporations? When parents or caregivers don’t make healthy choices, how are we supposed to expect children to do the same? They have to depend on us to teach them how to make good choices (when they want to actually listen to us). Yet, Oreos and Cheesy Puffs still land in the grocery cart more often than we care to admit because the fight gets tiresome. I totally get it, and I am completely guilty of this crime. But now that I have read some information from published research studies (check out new research done by Purdue University on dyes in foods), I now look at food labels much differently. And I have cleaned out my pantry and eliminated the foods that have these dyes. Sound impossible? It really isn’t too hard once you know what to look for and how to find substantial substitutes. What exactly are you looking for on a label? The most common dyes you will see in your boxes of macaroni and cheese, fruity kids cereals and powdered drink mixes are Red 40, Yellow 5 and Yellow 6. Companies also use Blue 1 (think candy-coated chocolates). 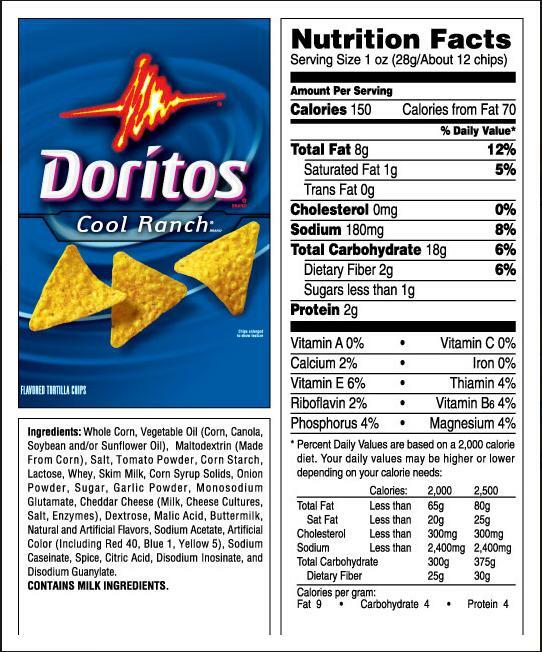 These dyes are listed for all to see, usually at the bottom of the ingredients, underneath the Nutrition Facts. When dyes first came into play during the 1950’s, not much information was available on the long-term effects they posed on the general public. But now that food companies put them in so many things we eat each day, the consequences are becoming greater and people want answers. More and more information is coming out each year about this subject, and in 2011 the FDA acknowledged that food dyes could cause behavioral problems. The findings from Purdue University’s research I mentioned earlier (Journal of Clinical Pediatrics) have found that when dyes are consumed in large quantities daily (100 mg or more), behaviors in children are affected. After pulling out a few things my daughter eats daily, (eh-hem) Kraft Macaroni and Cheese, I found out she not only eats too much sugar, but the foods I thought were okay turned out to have these dyes. It makes sense when you start connecting the dots, especially if your kid is acting out-of-the-ordinary. I am not throwing the gauntlet down and telling all of you to go crazy and throw out your entire pantry. But maybe just take some baby steps, like I am doing, and start eliminating/replacing certain items eaten most often with healthier alternatives. Look for organic items that use natural vegetable extracts for coloring. They will list these extracts on the ingredients, same spot where a dye would be located. And many organic candies, although use sugar, do eliminate artificial dyes. Drinks are the most notorious for using dyes, so try and find organic juices and sodas (this means no more low-calorie powdered drink mixes). I just found a company that makes flavored extracts for your water so you can still get a low-calorie option without the harmful side-affects (www.flavrzdrinkmix.com). And you have to remember the taste of what you replace your favorite snacks with will be a bit different, but isn’t it worth a try? My biggest smile from all this research is that it has NOT come to my attention to find Red 40 in any of my favorite red wine labels. Dodged that bullet, thank goodness! So open up a bottle of wine and start looking at your food labels. Let’s try and get awareness out amongst friends and family about why the FDA needs to really start regulating and eliminating these harmful dyes in our everyday foods.